Since it’s been a challenge to get in the craft room this week, I’ve had some extra time to hop around and look at some challenges and thought just maybe this little Thank You card might fit the bill for a couple of them. My card is just a 3X3 I like to keep this size on hand to stick in customer orders – just a nice little treat to find and I think it’s important to give thanks! A Seaglass base with the rainbow paper from Prickly Pear and my all time favorite long-retired M stamp which I colored in with my Shin Han markers. I quick knot of twine and a few Prickly Pear sequins finish things off. Seriously, if you’re ideas are waning in the heat and over whelming activity of summer take a look at some challenge blogs like Heart to Heart this week they are featuring Fabulous Fonts and Three Amigo’s Blog Hop Challenges where you’ll find Prickly Pear being featured during the month of July. Of course I can’t mention blog hop challenges without mentioning one of my favorites – Color My Heart Color Dare. Thanks for stopping by…I can’t wait to get back in my Craft Coop and start playing with my new things. Wow! It’s Wednesday already…where does time go? 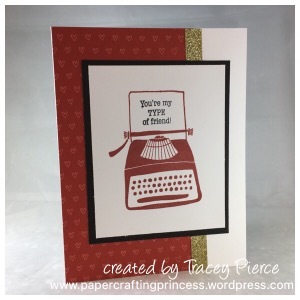 I’ve been having a blast showcasing the stamp sets that were brought back from retirement this month for Stampganza. Enjoy the Little things with it’s cute flowers and little tag sentiment reminding us to enjoy the little things. My 3X3 card was random stamped with the flowers in Glacier, Thistle and Lemon – notice how my random stamping is done in a triangular pattern – it really makes it an organized random 🙂 stamping off the page is good too! Most of the time I start with a larger piece of paper and then cut it down to the size I need for my card. Have you picked out your favorite stamps for Stampganza? You can find them here. Happy Friday and welcome to another week of the Color My Heart Color Dare. This week we are featuring the colors: Cashmere, Glacier, Lagoon, Sapphire and Whisper and White Daisy. 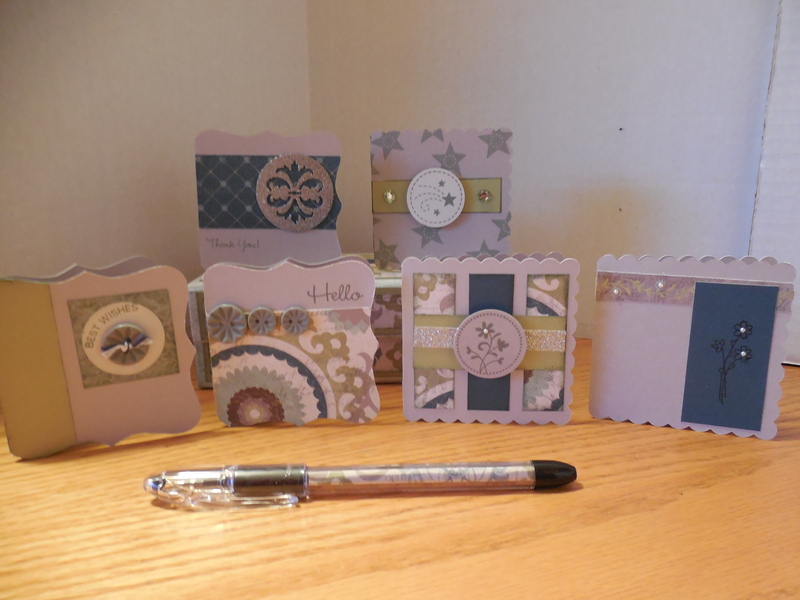 I’ve been making little cards all week, they are fun to have on hand to stick in a customers order, attach to a gift or hide in a computer bag as a surprise. I started with just a plain Sapphire star, but it seemed lackluster so I embossed it with the zig-zag embossing folder. I appreciate you taking a minute and leaving me a comment telling me what size card is your favorite to make. Happy Friday! 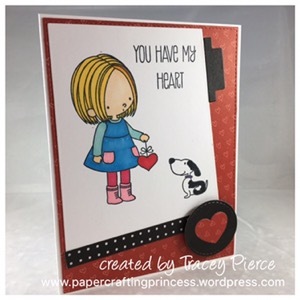 It’s time for another challenge from the Color My Heart Color Dare. This week we are featuring the colors Whisper, Pixie, Saffron & White Daisy. I like to keep a stash of thank you cards on hand and I loved the Happy Birthday card on p 45 of the Annual Inspirations so I changed it up and made it my own. I started with a base of Saffron, layered a piece of the Rustic Home Fundamentals Wood Grain paper and then got busy cutting my flower, leaves and banner from the Flower Market Cricut Cartridge. 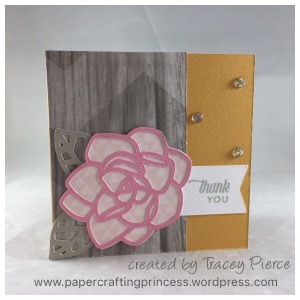 My flower base was cut from the pixie B&T from the Sugar Rush papers. I finished off my card by adding a couple of the new Gold Glitter Gems my sentiment is from the Short & Sweet set and fit just perfectly on my banner. In my humble opinion it’s a set that should be on everyone’s “must have” list. OK, now it’s YOUR turn! The full details on how to join the fun is on the sidebar of our homepage. Each color dare is open until 9:00pm CDT Thursday. While at the home page – check out what the other design team members have created and leave them some love (comments make our day)! Would you believe this adorable Pomegranate and Slate card is made from Zoe? A 3X3 card is perfect for leaving on a pillow, sticking in a briefcase or even in your child’s lunch box. I think it took me longer to cut all the paper than it did to stamp and assemble! Have you added Doodled Designs to your stamp collection? It really is a must have and fits our “M” size stamps perfectly. Thanks for stopping by. Leave me a little love and you might find this or one like it in your mailbox. Well, it seems as though I finally have made my way back into the craft room with one giant intention…getting things organized! What that meant to me was finishing some projects that have been hanging around for a while – like since last fall! It was a great accomplishment and now I can move on to new things…which includes making about 50 birthday cards for family and friends so that I don’t miss anyone this year! 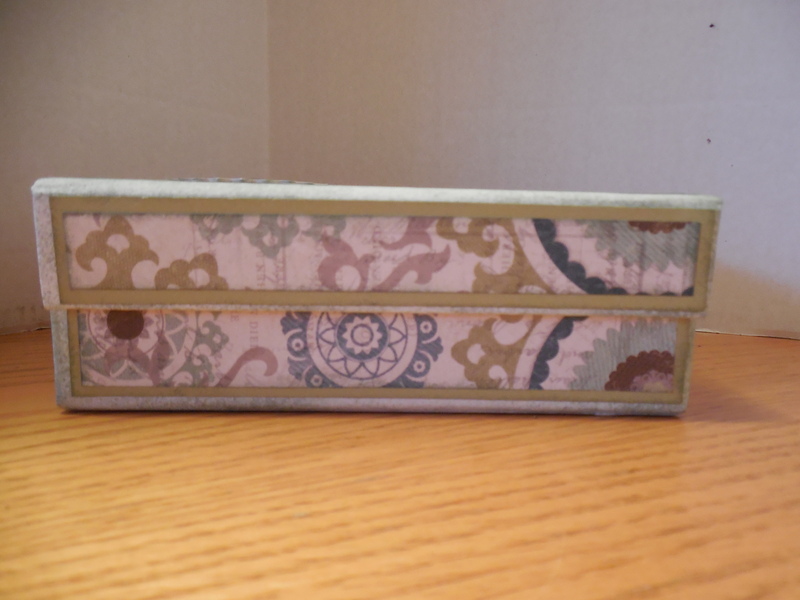 So, I thought this would be a great time to share a stationary box that I made. 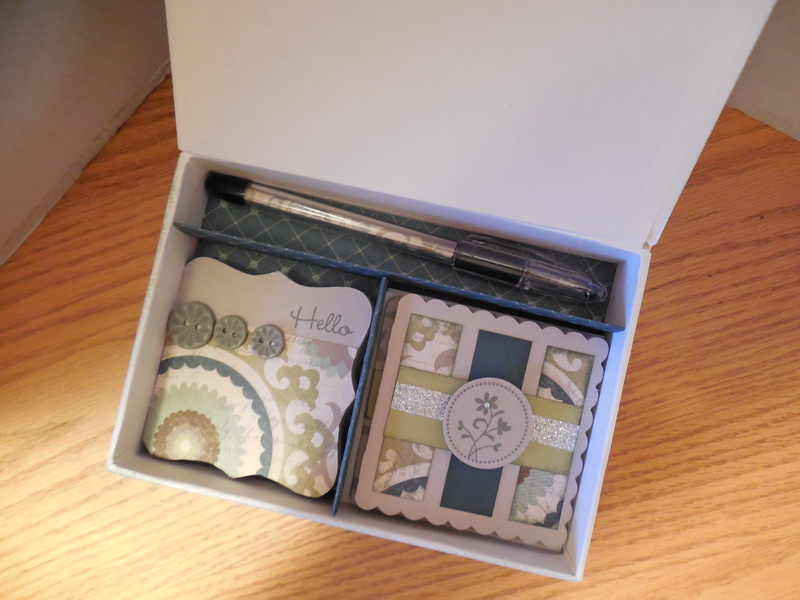 It was a quick easy gift using the My Creations Card Box (Z1647) and the Avonlea Paper Packet (X7155B) which I filled with 3 X 3 Cricut Cards cut from the Art Philosophy Cartridge and a pen that I filled with matching paper. 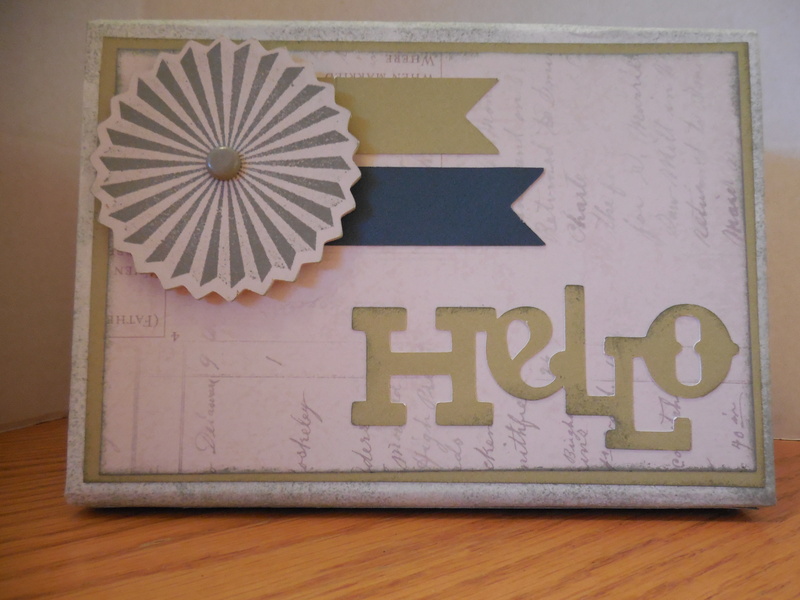 If you’d be interested in making one of these for yourself or a gift, give me a call!